No surprise – but Mike the storyteller did a nice job of telling the story of his perspective on marketing mix at HubSpot (with a $10k deal size) vs. how it's changed now at Cybereason (with a $250k deal size). At HubSpot, the business dynamics (customer acquisition cost requirements) forced Mike’s team to drive down cost per lead, and the only way to do that was through an inbound marketing machine. 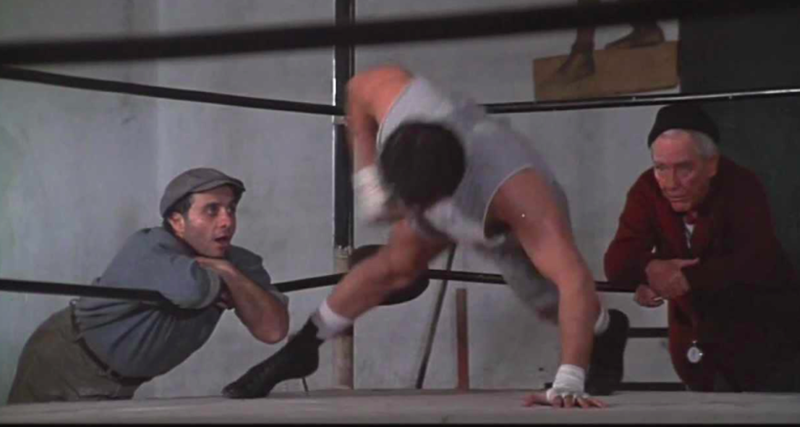 Mike equated that to Rocky 2, where Rocky forced himself to stop using his dominant right hand, and therefore had to work up his muscles in his weaker left hand in order to turn that into a competitive edge in the fight. Now at Cybereason, Mike is freed up to a much wider array of integrated marketing options, which also leads to a “messy mix” as Mike called it. Options that weren’t on the table at HubSpot (and in fact, HubSpot’s entire point of view outcasted to millions) are suddenly potential winners and drivers of business. The conversation then headed into a breakdown of how companies are applying ABM. I hadn’t met Tom before but we soon got into some fun Twitter banter and I came across another doozie from Tom on the topic. I liked ABM better when it used to be called marketing. Tom’s point – for many companies, ABM simply means having a marketing strategy to target the right accounts in your target profile (which hopefully was always part of your marketing approach) and do so across a marketing mix and with strong alignment with sales. Gotta agree there, and this is why so many will observe ABM (or ABE as Engagio up levels it to an overall organizational perspective) is “nothing new”. Alan Gonsenshauser from SiriusDecisions gave the Sirius perspective – there are three types of accounts – large, named and vertical. The Sirius large accounts category aligns to another concept that I see in account-based marketing, which is the “land & expand” program, where many of the marketing tactics are – yes, aligned with sales – and focus on running marketing programs to expand an account. This can work on behemoths where there is a constant move across product lines or divisions, or in a model where a business is looking to get customers on for a low order size initially, with expansion based on product usage or volume. I’d also add that in Alan’s third category of “vertical”, this can apply to any form of targeting where segmentation is applied, not limited to vertical. A popular one I’m seeing (and using myself at Bedrock Data) is technographic targeting, based on what softwares in use by the business. There was a sense a real frustration in the room with number of tools companies have in place. It makes you wonder if they bought them for the right reasons, and if they have the right people in place to own those tools. I have a rule of thumb, which is don’t add a software unless you have an owner in place to drive results from it. The thing is – messaging, or more broadly, storytelling around the company’s raison d’etre, and more broadly, brand – is oftentimes the lone differentiator out there. It’s what needs the attention from marketing leadership, and is an area most B2B marketers don’t spend nearly enough time on. Because ABM is just marketing after all, right? This meeting was a good way to kickoff what will be a hot season on the Boston B2B marketing scene. I’ll be at Hypergrowth, Inbound & MarTech over the next two weeks and MassTLC's Growth Conference on October 20th, and just like today I’ll be sharing the best soundbites & pics on Twitter @MoneyballMktr, so I invite you to follow along there. Marketing is a team sport. I’ve come to admire and relish being part of marketing teams that operate as a team – where team members excel in their roles and support each other, and the team evolves and improves and ultimately creates market impact “greater than the sum of the parts”. One such team is a group of modern Boston-area marketers who are now on their third venture together – first an initial group at HubSpot, then a larger group at SmartBear Software and now at Continuum Managed Services. You have to figure that if the team has stayed together over the years through multiple company moves (from Cambridge to Beverly to Boston), the recipe must be working and they must have figured out plenty of best practices along the way. So when I learned that Adam Barker, the Director of Demand Generation at Continuum, was going to be sharing his best practices around reporting and marketing process at the MassTLC Demand Gen Peer Group, that meant “Must Attend” for me. And Adam delivered the goods. They look for marketers who can go deep in a specific area of specialty, but also have a breadth of experiences and interests and the flexibility to operate in multiple areas. These metrics represent approximately 50% of quarterly MBOs tied to individual bonuses. There are regularly scheduled “lunch and learn” sessions where each team members presents a “how to” in their area, e.g. “writing a great blog post” or “running a PPC campaign”. This serves to both further develop skills as well as build team camaraderie, and is also a component of the MBOs for each team member. This is also a principle I’ve employed, which is reporting on activity alone sends the wrong message – because it’s not about activity, it’s about the results. Adam made the point that reporting on activity can actually serve to cloud or create confusion around performance and take away focus. As part of the process, each metric owner updates the metrics in their area weekly. These metrics are posted to a shared repository, in their case the company Wiki. Automated reporting is essentially to feed the process. Having now lived through seeing a product line move from manual to automated reporting, I can tell you that many businesses are still relying on manual reporting, and the shift from manual to automated is a true difference maker – in the visibility its bring and the marketing ownership that it enables. Meet with sales weekly and as part of this review the performance results (see #4). Adam’s group refers to these as “Smarketing” meetings – I first heard Mike Volpe CMO at HubSpot use that term to refer to joint Sales & Marketing sessions when meeting with him in 2009 – and I’ve also referred to this as the revenue team. Adam showed an example of an “anecdotal update” e.g. an email to the sales team with info on the success of a recent program. Everyone is likely doing this in some way, but referring back to #4 and what’s noteworthy about this update is it includes brief highlights of the programs e.g. # of leads or how it compares to results of other programs, to reinforce to the sales team that marketing has its eye on the ball. The marketing team defines deliverables as part of monthly sprints, which both ensures alignment and focus on specific deliverables and minimizes distractions getting in the way. The marketing leadership team stays aligned with a weekly leadership meeting. Each of these steps become more effective as team members get comfortable in the roles and their process. So like many things in marketing, it’s important to remain committed and the results will come through consistent application of the process. Last week I attended the inaugural MassTLC Demand Gen peer group headed by Christine Nolan of MassTLC and Jonathan Burg of Apperian – it was a vibrant discussion with 35 of the top revenue marketers in the Boston area. It was striking that with a group of that experience, sales alignment (or lack thereof) was the most common area of frustration shared by many. We were only able to cover some of the potential remedies in the discussion, so it inspired me to write and share this post – 3 Ways to Jumpstart Marketing and Sales Alignment. What these three practices have in common is they should help build that alignment by putting marketing on the same side of the table as sales by aligning around common goals. Also discussed in detail here, you, the demand generation marketer, should work backwards from the revenue forecast and use assumptions around conversion rates to show to both marketing and sales the number of MQLs required to meet the plan. It solves another problem expressed by a number of the marketers in the room – which is how do you govern processes such as sales acceptance of marketing leads? By building those assumption into your plan, it gives you a leg to stand on when reviewing numbers with sales management… if the metrics such as sales acceptance rates dip below the plan, it should become clear to sales management that the issue should be addressed. It’s not you, marketing, telling sales there is an issue -- it’s a lack of alignment to the plan which should flag the issue. This next one is a win-win -- make your marketing programs more effective AND build alignment with the sales team. Create “Rep Web Pages” which position each rep as an expert in their field. We demand gen need to remember that -- assuming our products are sold through sales reps -- then we not only need to market our products but also the reps whom prospects need to buy from – because nothing will be bought without a conversation with the rep. The pages include content of value to prospects and provocative questions representing a discovery conversation the rep wants to have with the prospect -- these are both credibility builders for the rep. The page also links to the their LinkedIn profile with similar messaging around the rep for social validation. Email programs both for outbound prospecting and nurturing are emails from the rep (plain text emails with their photo at the bottom), anchored by these rep landing pages aimed to attract the attention of the prospect and move them through the buying process. The Reps not only should feel good about seeing marketing putting them front and center, but the personalized approach to connect with prospects is a highly effective technique to break through today clutter of information overload. Other extensions of this including reps adding this page to all of their email signatures, accompanying emails with calls/voicemails directing prospects to their page and providing intelligence to the reps on who has visited their page to prioritize follow up efforts. In his book “The New Rules of Sales Enablement”, Jeff Ernst of Forrester Research quoted an American Marketing Association stat that 90% of marketing deliverables are not used by sales. A significant piece of this 90% comes from assets not being packaged and served up with clear direction to sales for how to use them. It’s a pain point for every sales organization and solving that pain point is a great way for marketing to achieve that “same side of the table” status. I recommend providing both email templates and the related content assets, grouped in categories that are actionable for sales. The first grouping would be buying stage, then by role, industry and/or topic. Opportunity – majority of assets for sales use will be during the opportunity phase. An area which marketing can help sales is providing sales with content that reps can provide their primary buyer to share with their buying team – content which help cement the value for the solution for each member of the buying team. Another asset type which sales will appreciate are objection handlers… content that they can share with prospects to address common questions that could otherwise stall out their deals. So what do you think? Please share other tips and tricks you've found for alignment between marketing and sales.